The Third Man is one of my favourite movies, which I believe entitles me to more film snob credit than I honestly deserve. I don't want it anyway. I like it for its sense of low-key hopelessness and heroic exhaustion. I like it for being firmly unsentimental while not being mean. I like it for its downbeat, depressed humour. Still, the movie's not important enough to me -- or perhaps I just didn't see it at a formative enough age -- that I'd immediately namecheck it as a writing influence. 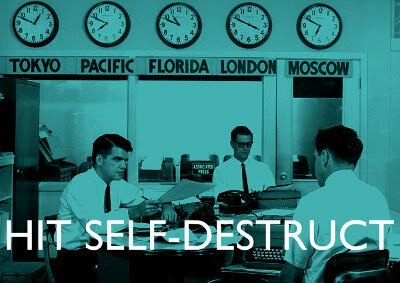 An influence on the writing I do outside of the medium of unpopular video games commentary, of course (you mean Hit Self-Destruct is not in fact influenced by Graham Greene? huh.) That's not to denigrate the quality of the movie or its value to me personally. It might not be a capital-i Influence but it's one of those movies that you watch and immediately find yourself in tune with. It affirms my perceptions of how the procedures and nuances of fiction really ought to be. That's the way being influenced should work; through exposure to a wide variety of media that subtly and subconsciously constructs individual prejudices and preferences. 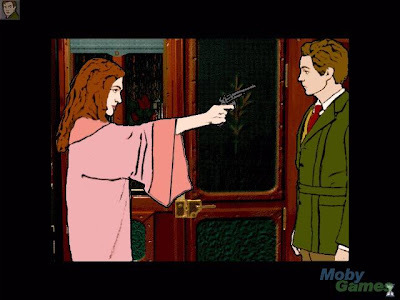 I've gone back and forth on whether I like it or not that the influence of one of my favourite movies on one of my favourite games is so transparent. The Last Express (written by Jordan Mechner and Tomi Pierce) switches the contentious four quarters of post-war occupied Vienna for contentious internationally zoned pre-war train cars. Penicillin smugglers are upgraded to arms dealers. The dead American still pulls his American hero friend (who's not that heroic) into the story. There's still a sullen, sultry Austrian woman named Anna. As much as it might seem like I'm building the case against The Last Express -- and I guess I am -- I really do admire it for drawing on something like The Third Man as inspiration, like I admire BioShock for much the same thing. Those games are entitled to way more literary credit than the games medium honestly deserves, not that the medium wants it anyway. 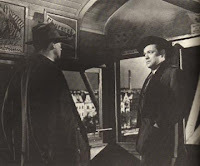 I also love The Last Express for not twisting the trappings of The Third Man into something strange and embarrassing, or taking the easy way out and rolling it all into some amorphous noir parody. By contrast, and yeah, I haven't played the game, I would love to know how Insecticide exhibits its purported The Wire influence. The Last Express is firmly not a familiar ride through superficial fictional touchstones. The story has a heart to it and while its point of view is not discordant with The Third Man, they're not stolen from it either. Even with all the Third Man overtones, this is decidedly a Jordan Mechner story. It's weird to be able to identify a writing style over only about three game narratives but nonetheless the idiosyncracies come out pretty strongly. Mechner likes to play with time: Last Express and Sands of Time's rewind functions, and Prince of Persia's time limit before them. There's always some element of inexplicable mysticism, a protagonist struggling to keep his head above the water, and a bittersweetly tragic romance. Mechner's become one of my favourite (and maddeningly infrequent) game writers, which is a preference based entirely on The Last Express and The Sands of Time. He didn't really do a lot of game writing before that. Of course, the lack of a strong narrative didn't hurt Karateka or Prince of Persia and the Prince of Persia 2 story is inoffensively bland in an early 90s platform game kind of way. I really do think it's impressive though that the only two games where he's arguably done any real "writing" are two of -- arguably! -- the best game narratives ever. Mechner writes with a distinct voice which comes across with tremendous clarity, which right there sets him apart from so many people who are writing games. To wrap up this low-energy meandering on influence, I have to wonder if there'll ever be a game narrative which will ever be cited as an influence on non-video game fiction. More to the point, I wonder if I'll ever cite a game narrative, since it is all about me. I actually respect a lot of game writing. Mechner, of course. Deus Ex's network of non-intrusive and colourful backstory. Anachronox's brutal honesty. Portal's slowly, beautifully revealing structure. Tim Schafer's effortless and immediate switches between comedy and incredible poignancy. Chris Avellone's gift for unleashing brutal, nihilistic sadness. And still I can't imagine looking at any of that and then looking at any other medium and thinking "hey, that's how it should go." Thx for this post. Interesting reading. Have been a huge fan of TLE for more than 10 years.